So, this is the first book from Staci Hart that I read. And not to be that basic person who says this, but it won’t be my last. I devoured this book, and every time I had a break during work, I whipped out my tablet to read more and got annoyed when my break ended. I had been in quite the book slump lately, but this drove me out of it, and I finished it in like three days. Cam: I felt like if I was a couple inches shorter and a few years older, I would be Cam. Minus the setting people up thing because I don’t do that. I live for romance through Christmas Hallmark movies instead. Cam was peppy and real. She wasn’t always happy-go-lucky. That just wouldn’t have been realistic. When she was jealous, oh boy, she acted on it. When she was sad, she let it out. When she was happy, we knew. It’s nice to see a female character in a book who goes through all the emotions. Nothing in life is ever simple, and I think Cam perfectly encompassed this. She didn’t take life too seriously at times, and that’s okay. Sometimes we have to let our hair down and pull the pencil from behind our hair out. (Do people actually put pencils behind their ears when they work?) We’re allowed to act silly and nerdy sometimes. Which also brings to her nerdiness. We need more female heroes who aren’t afraid to get a little fangirly and nerdy. I know I do! Sometimes I let my fangirl side out accidentally at work, but that’s okay. We are who we are. Moral of Cam: If you wanna be a nerd, be a nerd. Tyler: I was expecting the typical football, jock dude. However, I was pleasantly surprised that he wasn’t. Like, at all, you guys. Tyler is an example of a book boyfriend that you wish was real because omg. He was smart, sweet, successful. The 3 S’s that every girl wants (maybe just me). He also knew when to put Cam in her place, so he wasn’t someone you could walk all over. Which, speaking of, when he punched Kyle in the face for talking trash about Cam, I was HERE FOR IT. Kyle was the worst. It was also sweet to see Tyler’s closeness with his family, albeit briefly. You don’t see that a lot in romance books where the male character is on talking terms with his family. I really liked that about him. Side characters: Thankfully not annoying and didn’t steal so much focus from the mains. Wasted Words needs to be a real thing. A bar and a bookstore? Sign me up! I mean, that’s a genius idea, and I need to know if such a thing actually exists where I live. 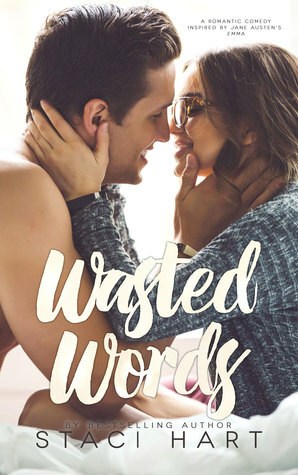 Most of the book was set at Wasted Words where Cam worked, which kind of added to the ambiance of the book, in my opinion. Staci Hart has my sense of humor, so I thought it was funny. The dialogue is so cheeky and at times, outrageous, but in the good kind of way. Think of “Friends.” The book was just so happy and I didn’t feel bogged down by intense moments of sadness and dread. That’s never fun. This was a pretty slow burn, but I wasn’t mad about it. I’m usually keen on the in-between of instalove and slow burn. However, I felt the slow burn between Cam and Tyler was necessary, especially considering Cam’s past relationships. I understood why slow burn was utilized for this book. They didn’t immediately get together and everything was rainbows and unicorns. They went through trials of “idk if we should actually date.” Not in this words, obviously, but you get my jist. The romance really didn’t happen until the last 100 or so pages, so the buildup was worth it and well-developed. I want to know the characters as individuals before I see them as a couple. Does that make me sound nerdy? Well, whatever because if this book taught me anything, it’s to wave my nerd flag. Overall, this was a light and quick read. It was definitely something I needed at the moment. If you’re feeling stressed with work or school or whatever, I would highly recommend. I can’t wait to try my next Staci Hart book. Plus, I always love supporting indie authors — they have some hidden gem books that are usually some of my faves.